Music comes in many forms, much of it is now digital, but depending on your age, there may be physical items in your home that contain music. Properly storing all types of musical media is important, so you can easily find and enjoy listening to your music collection. Let’s take a look at the different ways music is stored in our lives, and explore ways to better organize them. Audio cassettes are best stored in their original plastic cases. If you have a large collection, storing the cassettes on their side with the title spine facing out will work well. If you want portable storage, custom cassette zippered bags will help protect your cassettes. Please store analog media in a climate controlled area to prevent damage to your collections. Do not store in spaces such as garages, attics and basements. Mold, dirt, dust, and extreme temperature changes can easily ruin records, tapes, audio cassettes and CDs. Once your analog collection is organized, you may want to convert music to a digital format, or for nostalgia, memorabilia, or listening pleasure, you may want to keep your physical musical media. If you prefer to get your music digitally, there are streaming services such as Spotify and Pandora that you can subscribe to. If you prefer to store music on your hard drive or use a service such as iTunes to buy and download music files, be sure to back up your digital music library. Use cloud storage, external hard drives or flash drives to help prevent losing your music files. 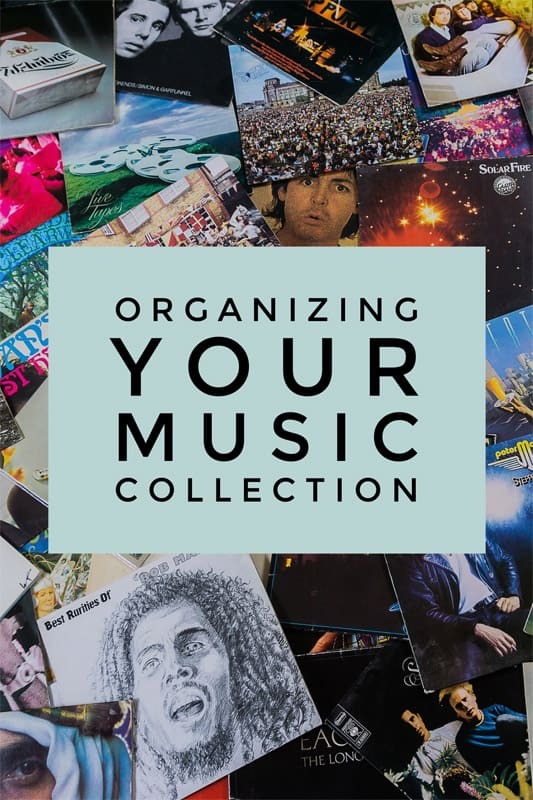 Whatever you decide, be sure to organize your music collection in a way that makes sense to you so you can easily find a song when you want to hear it. Choose the method that makes the most sense to you. With digital music files, you have the benefit of the search feature, but that’s not so with physical audio media. Also, you may want to cull your collection. If there are songs or artists you will never listen to again, sell, donate or give away your records, tapes, cassettes or CDs. If you store the music digitally, don’t be afraid to delete song files you do not enjoy listening to, to free up some space on your digital devices. My husband digitized our CDs a few years ago. We love that we can just pick a genre and press Random. We hear stuff we forgot we even had! That’s great! Digitizing makes it so much easier to access the music. I’m going to share this with my husband. He is a collector of mostly albums, but of course there’s some CDs and cassettes as well. Great storage ideas. Thanks. You’re welcome! I hope your husband finds this helpful! Those binders for CDs and DVDs save so much space! My husband had a lot of video games from years ago. We got rid of the plastic cases, put the disks in a binder, and that freed up a lot of space for other things. Yes, those binders are huge space savers! Thanks for commenting! I have a bunch of CDs that we never listen to, so I should digitize those and then get rid of them. I’m surprised to see your advice on cassettes and 8-track tapes… didn’t know people were holding onto those much anymore. I have fond memories of my Dad’s 8-track collection and listening to them in the car. Yes, digitizing the CDs will be a great thing to do. It is not common, but I have come across some music lovers, collectors or musicians who still hang on to cassettes and 8-track tapes. While we still have almost all of those mediums (vinyl records, cassette tapes, CDs,) like Janet, my husband digitized all of our CDs several years ago. He has the collection stored (and backed-up) on his computer and also stored on an iPod. I’m amazed that in one small device we have a massive amount of music. It takes up much less space than all of those CDs, and it’s easier to create playlists (especially for parties.) The vinyl records, which we rarely play are in traditional wooden crates. It’s interesting that they are making a comeback for newly produced albums. In a recent podcast, an artist said she preferred the sound quality and authenticity of vinyl. I also digitized CDs years ago, and it does save so much space! You’re right, vinyl records are making a comeback, and we can educate new vinyl record owners on the best way to store those. Unfortunately, I’ve come across old vinyl records damaged from temperature changes in attics, garages and basements in numerous homes. Great information! I would think laying the vinyl down would be better. Thanks for letting us know that they need to be standing up instead. I probably knew that when I had vinyl albums over 20 years ago. I wonder if there are people who actually have 8 track tape players outside of the car? You’re welcome Sabrina! Yes, I’ve seen 8 track tape players inside homes.